"You're Amazing" is the name of the stamp set I've used in today's inspirational card; but it's also a sentiment I find myself thinking of my family every day. We've just got back from our annual VW Big Bang festival camping trip and Mr Hippy proved he is pretty amazing - he built the most amazing fold-out bed for our van and upholstered the cushions that served as our mattress, never having done any sewing in his life before. He put our new awning up without having to look at the instructions ~ and trust me; this thing is like a small village. Little Hippy had only ever had one night in our van before, but she adapted well to camping over a few days and didn't complain once about the cold (though we did have a few tantrums over what she wanted to wear!). She slept through every night despite us being situated next to the event tent and despite the fact that it was minus two degrees at night. She loved the racing and though she wasn't sure of the event tent at first with the noise and the crowds and the lights she soon got used to it and had a great time.. Children are so adaptable! I used Baja Breeze and Chocolate Chip coloured inks with a splash of Crumb Cake. 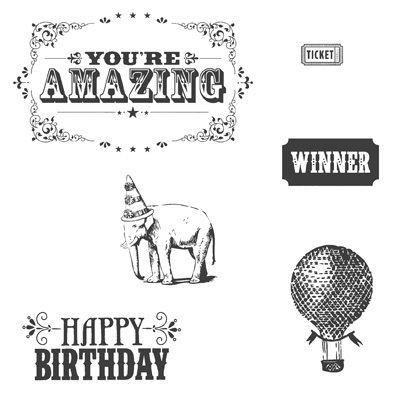 I used two Stampin'Around Wheels - Take a Ticket and So Many Stars. I've just got into using the wheels recently; they are so much fun and are practical as they can be used on larger projects (such as scrapbook pages), you just simply roll them along your page. Hello Hippy Chic I am loving what you have made with this set!1 It's now on my wish list!! Hello lovely, loved your fairy theme! I'm a fairy in my spare time (hence the La Fey!) ha!! I love this set the more and more I use it, it's fab. Why don't you host a party ?? STOP PRESS! Have you heard the news?